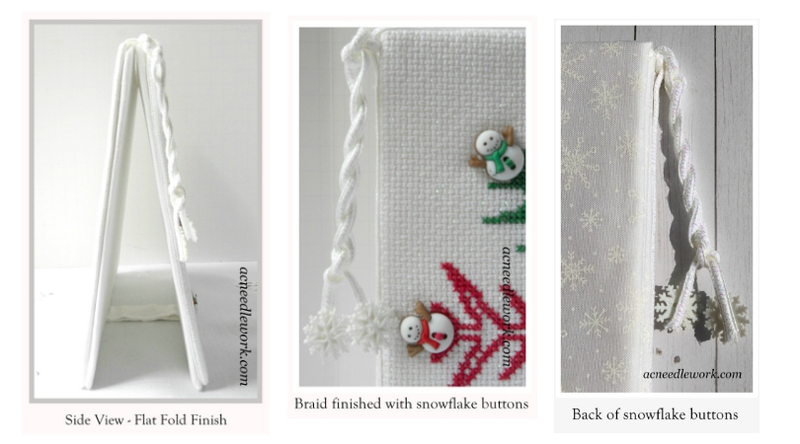 Last year while looking for some decorative buttons to use for ornaments on a cross stitched Christmas tree I was creating, I ran across these adorable snowmen buttons in the “Dress It Up Buttons” collection from the Jesse James Company. I had no idea what I would do with them but they were so cute I had to buy them. Then one day it snowed. I got inspired to create a pattern for a snowflake because it was “snow time”. 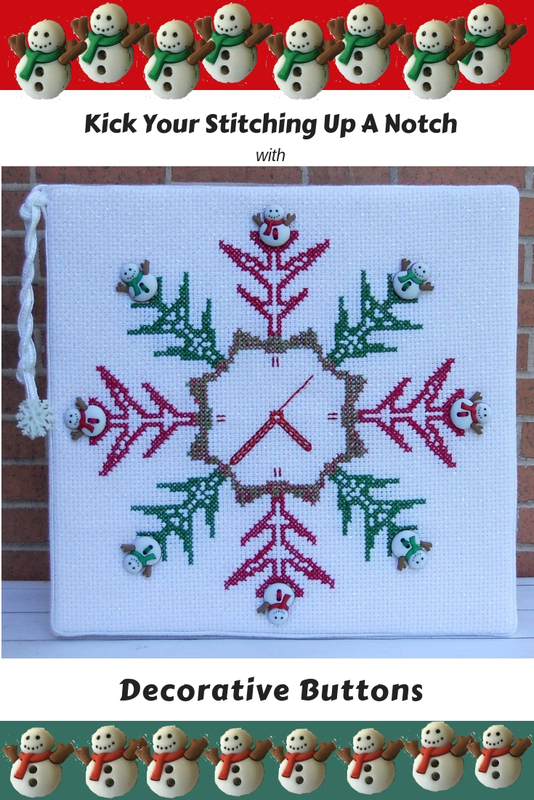 Soon I envisioned the buttons in the snow flake tips and a cross stitch clock was born! Keep in mind this pattern is versatile. Adapt it to your creative vision. Choose different buttons or don’t use buttons at all. Use a color palette that you like. Use a different count of fabric and change the size of the clock. Finish it in a hoop so it looks like a clock hanging on the wall, frame it, mount it on an acid free art canvas, or finish it with the flat fold technique for easy storage. Set up your fabric, floss, needles, etc. as you normally would for any project. Stitch the clock first. I used solid shades of DMC floss for the branches of the snowflake and stitched the outline of the snowflake center with DMC Coloris floss. Coloris is a variegated type of floss using complimentary colors. For tips on using DMC Coloris floss, see my how-to e-book, Christmas Tree Transformation at acneedlework.com. Then, using the Kreinik #8 braid, stitch and backstitch the hands of the clock, etc. This pattern is versatile, so feel free to set the clock hands for any time you desire. The buttons have two holes for attaching them to the fabric. Set the button in the curve of each snowflake. The pattern has French Knots to indicate where to place the buttons. Sew the buttons on with two strands of floss. Clean and press your finished clock as needed. Use a warm iron. Be careful to avoid ironing the buttons. You have many options for displaying your clock. Frame it or mount it on an acid free art canvas. Since this is a piece I will display seasonally, I finished it using the flat fold process. You can learn more about this process in a previous blog post, Finish Your Cross Stitch with the Flat Fold Process. 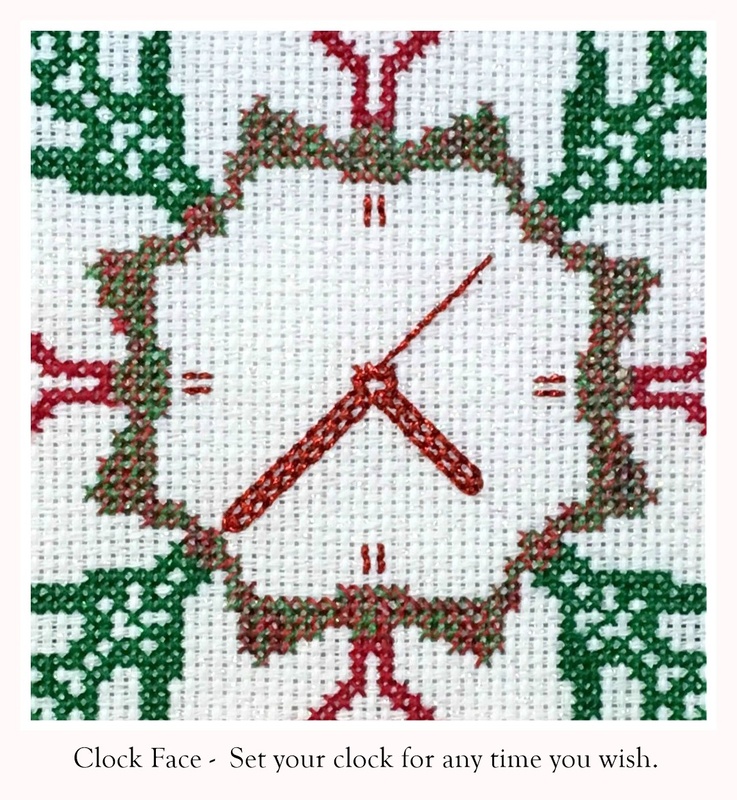 I hope the suggestions in this tips sheet will help you complete the cross-stitch design “Snow Time”. Decorative buttons can really add a new look to your creations. There are so many types of decorative buttons on the market for any theme or season your may desire. A quick search on the internet will take you to them. So, give them a try. They will really “kick your stitching up a notch”! What are your favorite ways to "kick your stitching up a notch"? Have your ever used decorative buttons in your cross stitch projects before? Share your experiences with me in the comment section below!